I am a sucker for funny dancing. I’m a goddamned fool for it. So it was perhaps inevitable that tonight’s no singing, all dancing episode of The Office would make me borderline euphoric. Tonight The Office finally, definitively shook off the cold grey reign of Charles Miner and tapped into a rich vein of pure, unadulterated joy. But first there was a cold open that featured Dwight at his douchiest. Solely to bait Pam and mock her artistic aspirations, he pays new receptionist Kelly to pretend that she’d won an art contest. Not cool, bro. Not cool. Without his relationship with Angela and the ensuing heartbreak to humanize him, Dwight has devolved from jerky to evil. Since he was still renting an office for the defunct Michael Scott Paper Company, our intrepid hero decides to transform the space into a venue for two of his favorite preoccupations; dancing to cheesy disco and drinking espresso. In a sense, Michael was creating a PG, watered-down version of the coke-and-disco wonderland/hellscape Ryan was forced to abandon when he got clean. Phyllis decides to bust a few moves with Michael but ends up injuring her back. Thankfully Dwight is on hand to treat her the same way he treated a beloved family horse that was a majestic racer and even more majestic fodder for beef jerky. While Michael and Dwight attend to Phyllis, employees slowly begin gravitating to the dance floor. The two Kellys begin dancing and no one red-blooded heterosexual man can resist the siren song of cute girls gyrating suggestively. A pompadoured warehouse worker lights a flame that quickly turns into a full-on disco inferno. This leads to all sorts of awesome physical comedy, from Andy’s elaborately choreographed dance challenge to to Kelly Kapoor recreating key moves from Flashdance. Oh, and Jim and Pam almost run off to a courthouse to get hitched. 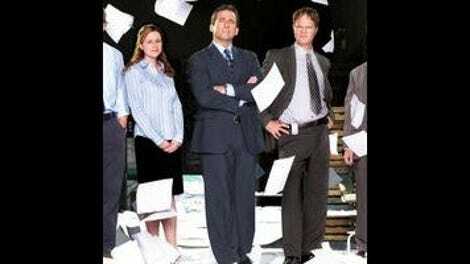 In a sly move, perhaps the biggest event in the history of The Office—the long-awaited marriage of its resident lovebirds—registers almost an afterthought to one of the silliest, goofiest, most ephemeral central plots in the show’s history. It turns out to be something of a tease. Jim and Pam don’t end up getting married and while dancing exuberantly with their co-workers and friends they realize that they really do want a big conventional wedding after all. With a light touch the show made an insightful point—that we need our dance-offs and workday discos and spontaneous expressions of delight. They might be silly, they might be ridiculous but they’re pretty damned essential all the same. When people get married they’re not just doing it for themselves; they’re also doing it for their families and friends and everyone who wants to get drunk and make a fool of themselves on the dance floor. That’s why I borderline revile the mercenary culture of weddings and wedding planners and the grotesque expense that goes into most of these ceremonies but kind of love weddings themselves and consider it my solemn duty to get drunk and dance to the point of exhaustion. It was a neat touch that the Dunder-Mifflin gang was dancing largely to the kind of hoary old chestnuts that get hauled out at every wedding. In the end Michael achieves his silly, wonderful dream of a daytime disco where the Dunder-Mifflin gang can forget their worries and give themselves over to the music. As usual, it just ends up happening despite his best efforts, not because of them. —“You can’t steal what is legally your property”.